This is genuine Swarovski Crystal, which is manufactured in Austria. 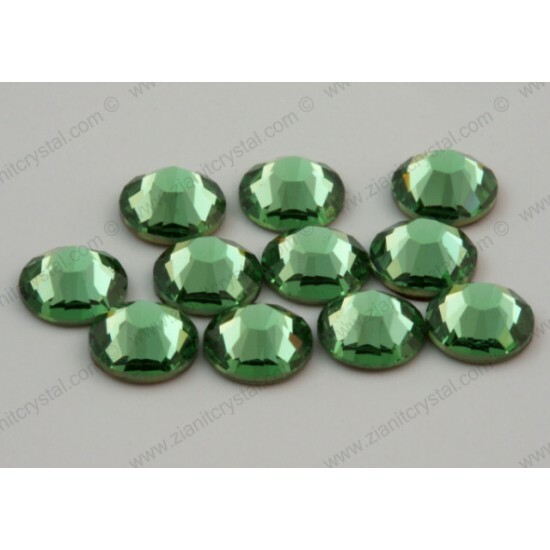 The size is SS 12 (~3.2mm) and the colour is Peridot (214). The XIRIUS Rose (2078) collection takes crystal one step closer to the diamond. Experience a new level of brilliance, scientifically proven but is also evident to the naked eye. When you look flip it over and look at the back of the stone, it is a copper color. This is also patented by Swarovski and offers an easier way for you to ensure you are indeed getting genuine SWAROVSKI ELEMENTS products! This is genuine YHB Glass Crystal, which is manufactured in China. The size is SS 10 (~3mm) and comes with original factory packing of 1,440 pcs per p.. This is genuine Swarovski Crystal, which is manufactured in Austria. The size is SS 12 (~3.2mm) and the colour is Crystal Color (001). Swarovski cr.. This is genuine Swarovski Crystal, which is manufactured in Austria. The size is SS 12 (~3.2mm) and the colour is Crystal AB (001AB). Swarovski cry.. This is genuine Swarovski Crystal, which is manufactured in Austria. The size is SS 12 (~3.2mm) and the colour is Jet (280). Swarovski crystals are..